Similes are wonderful literary tools. Being able to compare two dissimilar things in a way that brings out subtle nuances and insights is quite enjoyable. Here are a couple of examples off the top of my head. (I don’t pretend others haven’t written these things, but I didn’t plagiarize them.). A politician is like a weathervane. Arguing theology is like having indigestion. Disliking Narnia is like hating a feast. Metaphors, of course, are far more powerful than similes. When we consider a metaphor we are pondering how two different things actually share some fundamental quality. Comprehending metaphors requires the ability to think abstractly. A child—confined to a world of concrete concepts—cannot begin to think of their nation as a “motherland” or “fatherland,” as the case may be. Yet, those are powerful nurturing and bonding words that countless patriots have embraced throughout the centuries. A simile might say “our country is like a family.” A metaphor suggests far more. In this case, it might convey that one’s allegiance to their nation should exceed their loyalty to their biological kin. Nowhere is the magnificence of metaphors more manifest than in the way we talk about God. One of the most famous biblical passages is a straight forward example. “God is love” (1 John 4:8). Jesus the Christ said of himself, “I am the Way, the Truth and the Life” (John 14:6). He also called himself the “Light of the world. Whoever follows me,” he added, “will not walk in darkness, but will have the light of life” (John 8:12). It is a sad thing when a symbol loses its meaning. There is a prime example of that phenomenon in Oxford. And you can see it in the sign that hangs above a pub frequented by the Inklings. No, not the Eagle and Child, which they affectionately referred to as the Bird and Baby. Mon 11 March it is. But note that our causeries de lundi are now permanently transferred to the Lamb & Flag. We were sorry to break with tradition, but the B & B had become too intolerably cold, dark, noisy, and child-pestered. Sadly, when many people look at the Lamb on the pub’s sign, they fail to recognize it’s significance. 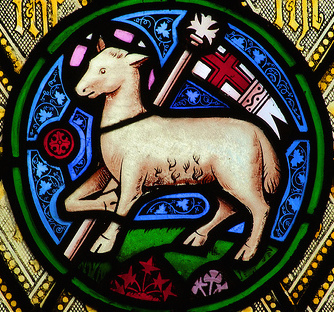 The lamb carrying a cross-emblazoned banner is nothing other than the Agnus Dei, the Lamb of God. What, some may wonder, is the Lamb of God? The better question is “who” is the lamb. The symbol represents Jesus Christ himself. It hearkens to the declaration of John the Baptizer as Jesus approached the Jordan: “Behold, the Lamb of God, who takes away the sin of the world!” (John 1:29). To understand what it means to say “Jesus is the Lamb,” requires two things. First, a recognition that it is more than a simile; it is not simply that he possesses some of the attributes we would naturally associate with a lamb, such as gentleness. The second requisite is that we understand something about the Jewish sacrificial system. For, Jesus being the Lamb of God means nothing less than that he is the true, complete, ultimate and final sacrifice for the sins of humanity. And that is a wonder definitely worth pondering during this Christmas season.